This hotel captures Vienna's rich cultural heritage with a magnificent Art Deco design, showcasing more than 1,000 original works of art. Rooms and suites feature timeless design, with marble bathrooms and balconies on the penthouse floor. Perfectly situated on the famous Ringstrasse, the hotel is only minutes from the Hofburg Palace, the Kunsthistorisches Museum and a wealth of other attractions. 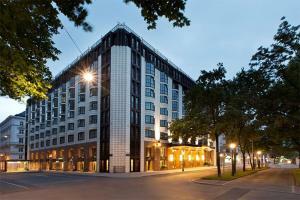 Located in the commercial heart of the city and just 20 minutes from Vienna International Airport.